In my never-ending quest for the best pillow I recently tried out the Snuggledown side sleeper pillow. I wasn’t sure how such a cheap pillow would hold up but first impressions are fantastic. I’ve had an older Snuggledown pillow before and it only lasted about 6 months before it started going lumpy and about 9 months before it became plain old uncomfy. So that’s where the price comes from. 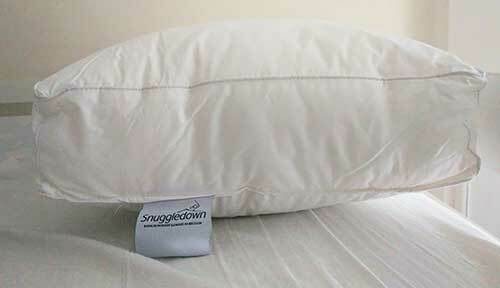 But if you need a comfy pillow that’s really cheap then the snuggle down is a great choice. This Snuggledown pillow is really plump so it works really well on its own. A great plus because it means you only need the one to enjoy it. The thickness is about 18 cm when fully plumped and it’s got a nice firm feel so it doesn’t squash down too much. The firm feel gives you great support along your neck when you’re sleeping on your side but I found it’s still quite comfortable when you’re sleeping on your back too. 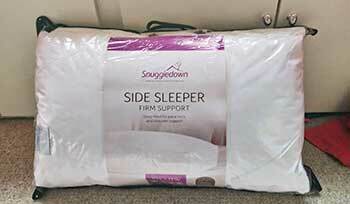 The best thing about the Slumberdown Side Sleeper pillow is the box support shape it has. The squared sided shape it has means it gives you all the support you need for sleeping on your side. But it’s not so much that it’s uncomfortable on your back. Ideal if you like a fuller pillow. The filling is a cluster fibre, cheap and cheerful as long as you don’t move it around too much it normally lasts well enough. I’ve only got 9 months out of a similar pillow but I handle my pillows a lot. The casing is a nice 230 thread count which is nice and soft for inside a pillowcase. 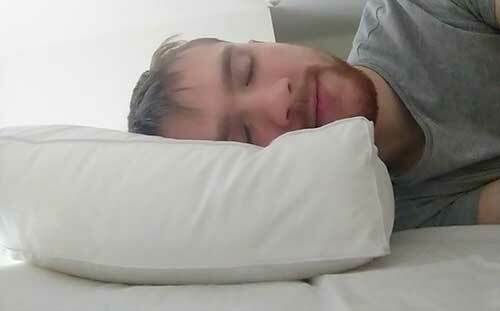 A great pillow for side sleepers if you’re on a budget, it won’t last the longest but it’s comfortable while it does and just gets a big lump after that.